If you observe “Required” lookup field on an ‘Appointment’ form, you can choose more than one Accounts or Contacts or Users. Though it looks like a normal lookup field actually it’s a field of type ‘Party list’. Part List type field, renders as Lookup on the form, but it works as multi select lookup. Please make sure you are setting right values using “queryStringParams”. Post the values you are passing and error text to find out cause of issue. I used your code set to field of email form.It sets the value.But when i click on the link it opens the create new record,even if the record exists. Did the lookup resolve the party you set. Please provide your script to analyze more. Thanks for your code it worked. I Used code below and it is working fine. 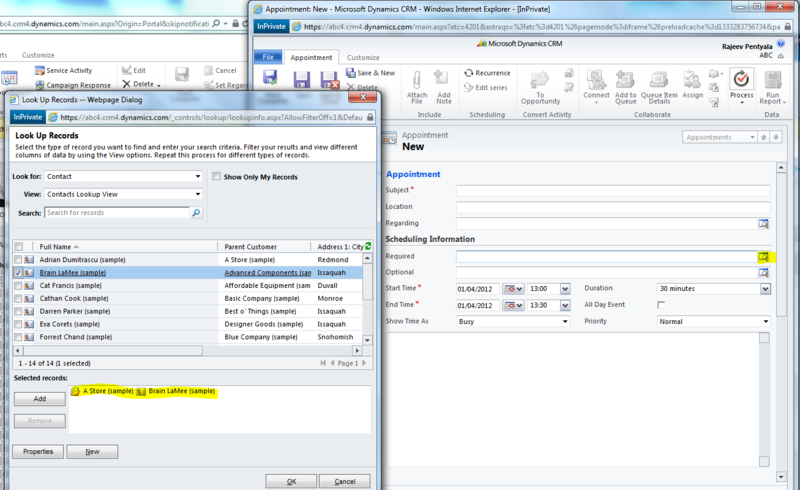 Is there a way to make use of this party list field in any of our custom entity in crm 2011? If so please guide to proceed, that will be really really helpful for me. We cant create new PartyList field. However, you can create a new custom activity, with that you get out of the box PartyList fields. I would like to make use of the partly list to Case entity. Is that possible to achieve? Can you try by giving “SystemUser” lowercasing. (i.e., partlistData.entityType = “systemuser”). Let me know if you still face the issue. ‘to’ is the field name of Appointment entity. It considers the ‘Primary Email’ (I.e.,emailaddress1) field value of the Contact\User\Account . I have a requirement when user create email activity from custom entity (contract) then in “To” field of email activity form, user can see the all the contacts associated to contract account (means account is parent of contract record) . So here i have to create one filtered custom view on Contact associated to Account. Can you help me , how to achieve this? Thanks a lot for this blog. It really helped solve my purpose. The following alteration worked for setting email’s to attribute in CRM 2015, the only change is object’s type is to be set and not entitytype. Thanks for posting this useful blog. I’m trying to insert multiple participants into the email “to” field when users click on “Reply All” email. However I need to remove certain email address from the To line. So I put the original To into an array and then loop and get all the email addresses except the one that needs to be removed. However the problem here is I only see the first participant is listed on the Reply All email form. Could you please advise on how to populate multiple email participants? Appreciate your help in this, thanks in advance. When I enter values in “Required” field in Appointment and then while converting the appointment to Case the pop-up auto populates the “Customer” value with the “Required” value in appointment. That is working fine. But when I do the same for a custom activity, then the “Customer” field is not getting populated with the “Required” filed value on custom activity. Is that the expected behavior for a custom activity or we need to do anything else ? Hi, I have added this Java Script in form properties and On change event of “Required attendees” field. But it gives below error.